This is a lovely Grevy’s zebra showing off his white belly. I really like zebras and my sister likes horses, so today I want to write about Grevy’s zebras. These guys are the largest species of zebra and the largest of all of the wild horses in the world. They can grow to up to 275 cm long, 160 cm tall at the shoulder and weigh up to 450 kg. Unlike other species of zebra, Grevy’s zebras don’t have any stripes on their belly, which is how you can tell them apart. They also have a much higher crest than other zebras. Newborn foals can stand up after just 6 minutes and run after just 45 minutes. This helps them to escape from predators such as lions, hyenas, leopards, cheetahs and African wild dogs. Grevy’s zebra stallions are very territorial and have the largest territories of any land herbivore, defending areas of up to 10 square kilometres. They live in dry areas and can go for up to 5 days without water. They can also dig holes to find water when necessary. These beautiful animals are endangered and are only found in parts of Ethiopia and Kenya. Their numbers have dropped from about 15,000 in the 1980’s to less than 3,000 today due to hunting, habitat loss and extreme drought. 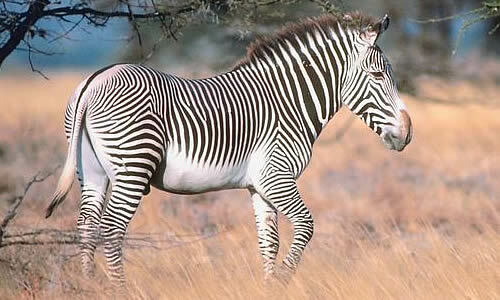 Are there any other interesting facts that you would like to share about Grevy’s zebras?